That sounds amazing! I have a question about the recipe. After steeping the mint leaves & stems, do you leave them in the milk/agave mixture and blitz it all up with the avocado or remove the mint first? This looks fabulous! 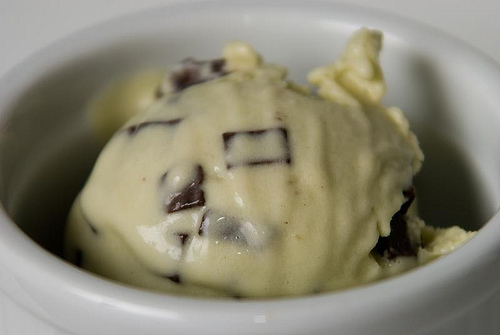 So did you notice that the avocado increased the creaminess of the ice cream? Oh my God. Thank you! Thank you! Thank you! Sally, I heart mint ice-cream and thought I would never be able to have it again. You rock! I’m so lucky to live down the street 🙂 This stuff is amazing! Wardeh–Yes, I think the avocado does add a nice touch of extra creaminess. Your ice cream is gorgeous!! It sounds infinitely more pure and delicious than any store bought ice cream… Perfection! i applaud you for taking care of your health. in january i began exercising and watching what i eat, as well. i had only 15 pounds to lose, and i’m nearly there, and it feels great. you look fabulous! thanks for your post on my blog, as well. my husband took the wing shot. he’s got the better photographic eye. Yay! This IS an easy recipe. I may have to pick up a few coconut cans on my next grocery trip. We have some ice cream in the freezer, but the last few times I had some my tummy was not right. I may try to lay off the dairy. I’m so glad the coconut milk worked–I’m going to pass this recipe on to one of my lactose intolerant friends who loves ice cream! That looks fabulous!! Deliciously creamy and decadent all at the same time. You’re so inventive – the avocado is a wonderful idea. Good thing I have most of these ingredients in my cupboards because I’m definitely going to have to try this (I have pineapple mint right now too – hmmm!). Wow…gorgeous. I’ve heard of using avocado in ice cream or other sweet preparations but I MUST try this. I got an ice cream maker last year but rarely use it because I avoid dairy (most of the time…). I made this loveliness this morning (after having chilled the base). So easy…especially with my immersion blender to puree the avocado. I plan to share it with my sister tomorrow. Incidentally, I love the light olive/grassy green color of it. I just love color. I’m an artist after all. 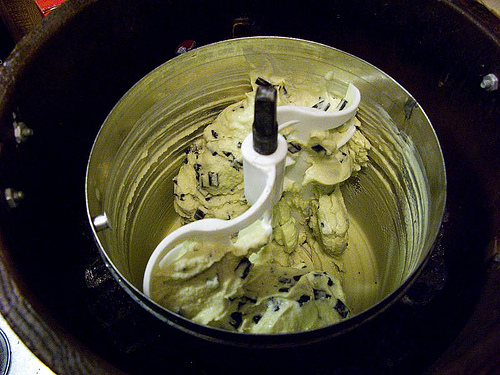 It’s actually more satisfying than the fake green of mint chocolate ice cream. I made one modification which is to add vanilla. I like it but I think it would be good without, too. My husband, daughter and I ate it this morning on top of a gluten-free pancake. Man, does that ice cream look good! An avocado? Wow, interesting idea. I’ve put avocados in all kinds of things, but never ice cream. I’ll have to try this. P.S. I LOVE that picture of you on your “About” link. What a cutie. I’ve said this before, but nice hair, Sally. This sounds wonderful but I have a question about substitutions? Can you sub the Agave with Honey or Maple syrup? My son cannot have cane sugar or Agave but can have honey , stevia or Organic maple syrup and this ice cream sounds great other than the agave. Kat–I’m not sure what would happen, but I think it would be worth trying. The difference in viscosity of honey and agave might be an issue. . . . If I made it with maple syrup, I’d add extra maple syrup and wouldn’t do a mint ice cream–I’d maybe do a maple/vanilla/toasted nut ice cream or something like that. Yum! Let me know how it works if you try out a substitute. Thanks Sally. I am just struggling for recipes for our family since finding out my son is unable to have wheat, dairy, soy, gluten, yeast or sugar. It has been very hard to find substitutions for anything he is used to eating and I am not much of a cook at the moment. My son is 3 1/2 and not into trying new things. I figured with the avocado being added to such a sweet dessert would help me “hide” his veggies and fruits. We are close to getting him healed from his regression that,we believe, was casued by his vaccine shots. Now if we could just get the diet in order he will be so much better. Thanks for the ideas. I will try it soon. one question for you– i’m making the ice-cream, but it says 1 cup agave, but in the recipe it’s 3/4 cup. any clarification? Oops, I’ll fix the recipe now. Thanks for catching that. Thank you so much! I made this ice cream a week ago and I’m ready to make some more. The first few bites I had I wasn’t sure what to think, but after that I loved it! We’ve been going without ice cream for so long at our house – this is fantastic! I assume it would affect the volume of the liquids so what could be substituted? Susan–Of course, the ice cream wouldn’t be as sweet with less as agave, but the creaminess primarily comes from the coconut milk, so I think you could decrease it and still have the recipe come out fine. I wouldn’t worry about the decrease in volume. You could also use a different sweetener to see if that works; if you do, please come back and let me/us know how it goes! Can I substitute the coconut milk with raw goat milk? I am looking at this recipe and your Vanilla Ice Cream with Raw Goat Milk that includes egg yolks ~ is that because the goat milk isn’t as creamy as the coconut milk ? (though I’ve never had coconut milk). Oh, my apologies. I got to your blog by a link from the Vanilla Ice Cream with Raw Goat Milk recipe on gnowfglins.com. My diet is free of gluten, sugar and now, dairy. Although I tolerate raw goat milk I am going to try the coconut milk. It sounds like a good alternative and this recipe sound so good ~ I love mint and have it popping up all over the yard! Thanks!!! Would this work with honey instead of Agave Syrup? We have this digestion diet going on so no Agave Syrup for us. Nathan, it might change how firm the final ice cream gets, and it will alter the final product’s taste a bit, but it will still taste great with honey. Hey, I just finished making this. It’s nice and creamy (Even with the honey instead of Agave syrup). So You might want to add to the instructions saying that honey will also work. Although personally, I don;t think 1 Cup of honey is enough. I’ll try a cup and a half next time. please can you clarify the measurements on the mint ice cream please,what does c stand for? Other than agave syrup or honey, what other natural sweetner would you use. I don’t want to use equal or any of that bad stuff. Thank you. Looks yummy! Have you tried making ice cream with xylitol, erythritol, stevia, or luo han guo powder at all? I was also wondering where you buy your chocolate chips? Hi, Heather. No, I don’t use any of those as sweeteners. Other than luo han guo, which I have never heard of, stevia is the only one I would consider, and it tastes bitter to me and makes me fairly jittery. I have used pureed dates in coconut milk ice cream–makes it more like frozen pudding, but that’s not a bad thing! Honey also works. Thanks for sharing this recipe. I want to know, what would be a great substitute for the avocado? I’m allergic to avocado. Thanks for your suggestions in advance. You can omit the avocado. It just won’t be quite as creamy, but it’ll still be good. Hi Sally, Looks like a wonderful recipe! I’m just wondering what type of Ice Cream maker you used? Livvy, we just use one passed down in my husband’s family–nothing fancy. I see a previous question about the quantity of coconut milk, but I don’t see the answer. Can you please clarify that? I have two can sizes in my cupboard, and am anxious to make this!